Villanova coach Jay Wright shouts instructions to his team during the first half of an NCAA college basketball game against Providence on Wednesday, Feb. 14, 2018, in Providence, R.I.
PROVIDENCE, R.I. – For the first game in a difficult stretch that will see them play four of five contests on the road, the Villanova Wildcats found themselves Wednesday night in probably the loudest and most raucous arena of them all. The Dunkin Donuts Center was rocking with a sellout crowd of 12,887 and Providence fed off the energy, especially at the defensive end where they crowded the third-ranked Wildcats at the three-point line and dared the visitors to beat them inside the arc. The Cats had ample success on two-pointers but that couldn't overcome their miserable 3-of-20 performance on three-point attempts, and the Friars capitalized with some key baskets of their own to record the upset, 76-71, and touch off a storming of the court by fans. Coming off a two-game stretch where it had shot 27.5 percent from distance, Villanova (23-3, 10-3) again couldn't find a way to get its long-range shooters open. The Wildcats didn't hit a three-ball until Mikal Bridges, their high scorer with 19 points, connected with 13 minutes, 14 seconds left in the second half. The Cats had starting forward Eric Paschall back after he missed two games while in concussion protocol, but they went the entire first half without an offensive rebound, and grabbed just four on the night. In addition, they tied a season high with 19 turnovers – 13 in the second half. Their point guard, Jalen Brunson, who hadn't committed more than three turnovers in a game all season, had seven. 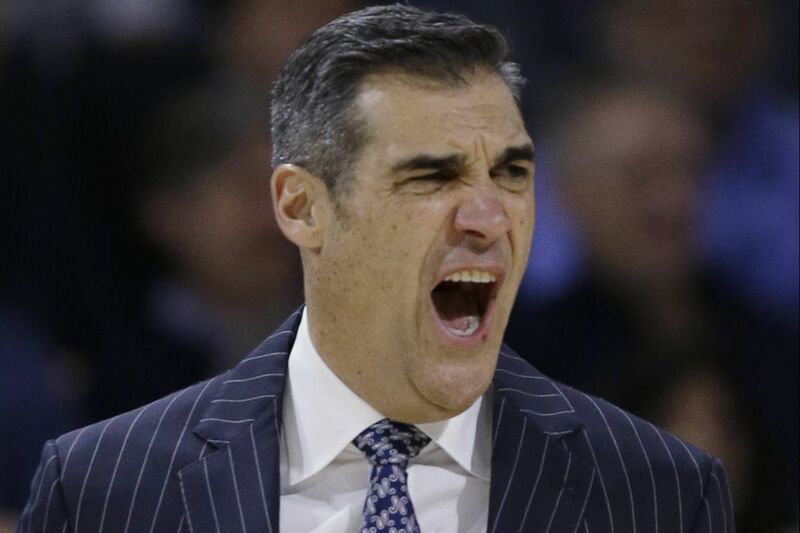 All in all, it was a long night for Jay Wright, who had a profane chant directed at him by the Providence student section closest to the 'Nova bench after he had a heated discussion with official Matt Potter. He credited the Friars (17-9, 8-5) for playing physical defense on the perimeter. "Just real physical staying with us, physical on the ball," he said. "They didn't allow us to really get by them. Even to start our offense we couldn't get ourselves open. We weren't physical enough to get open. So then we couldn't run the offense. We were forced to drive the ball and they were more physical than us in that area also." Brunson, who fouled out with 1:08 to play after scoring 14 points, echoed his coach. "They were just really physical," he said. "We were uncharacteristically giving the ball away, not being strong with the ball. A lot of credit goes to them, but we can definitely get better in that aspect." The Wildcats were 14 of 16 on two-point shots in the second half but trailed the entire period. Their largest deficit, 49-39, came with 11:28 remaining, and they answered that with an 8-0 run that ended with a Bridges three that got his team within two with 10:25 to play. But Villanova would never get closer. Providence got its advantage back to nine, 67-58, on Jalen Lindsey's pair of free throws with 3:34 left. The Cats didn't make it a one-possession game until Collin Gillespie's three-pointer made it 72-69 with 29.8 seconds to play. But after a free throw by Kyron Cartwright, who led the Friars with 17, Donte DiVincenzo missed a three-point shot, and the Cats lost for the second time in three games. "Just trying to pay attention to detail," Providence coach Ed Cooley said of his team's three-point defense. "They've had four or five games this year where they had 15-plus threes. They're a great three-point shooting team, a great offensively efficient team. We beat an unbelievable team today."